Alexei wants to get as high an exam grade as possible whilst sacrificing the least possible amount of free time. We have seen diagrammatically that he maximizes his utility by choosing the point where an indifference curve is tangential to the feasible frontier, at which the marginal rate of substitution (MRS) is equal to the marginal rate of transformation (MRT). In this Leibniz we show how to formulate Alexei’s decision mathematically as a constrained optimization problem, and solve it to find the optimal combination of grade and free time. Alexei’s optimal choice of free time and exam grade is illustrated in Figure 1 below. It combines his feasible set and indifference curves. The optimum is achieved at the point E on the feasible frontier, where the frontier has the same slope as the indifference curve. Alexei’s optimal choice of free time and exam grade. Figure 1 Alexei’s optimal choice of free time and exam grade. Thus Alexei’s problem is to choose t and y to maximize subject to the constraint . This is an example of what is known in mathematics as a problem of constrained optimization. Sometimes in this sort of problem the constraint is written as an inequality: , which can be interpreted as saying that his choice must lie in the feasible set. But because his utility depends positively on t and y, we know that he will want to choose a point on the frontier. So we can write the constraint as an equation, which makes the problem easier to solve mathematically. 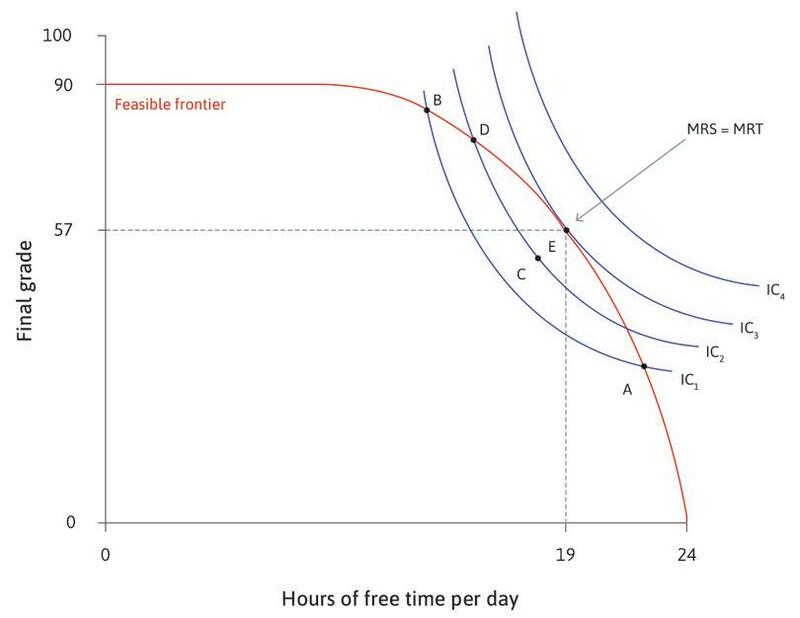 This equation says that as we move along the feasible frontier in the direction of increasing t, the net effect on utility is the result of the direct effect of more free time, which is of course positive, together with the negative indirect effect of a lower exam grade. This is known as a first-order condition for optimization, since it was obtained by equating a first derivative (in this case the total derivative ) to zero. Because much of economics concerns constrained optimization, you will find similar conditions in later Leibniz supplements.